There were at least 845 Silver Stars bestowed upon Soldiers from the 32D ‘Red Arrow’ Division during WWII. At least twenty-two Division Soldiers were decorated with the Oak Leaf Cluster (OLC) to the Silver Star (signifying a 2nd Silver Star) during WWII; Col. Ernest A. Barlow, Capt. Edmund C. Bloch, Col. Joseph Sladen Bradley, Capt. Peter Louis Dal Ponte, Capt. James Walker DeLoach, Jr., Pvt. Ernest Desko Erickson, Pfc. Manuel P. Garcia, Capt. Roy A. Glisson, Maj. Parker C. Hardin, Col. Merle H. Howe, Tec. 5 William A. Inman, Pvt. David S. MacKay, Sgt. James R. McCune (McCue), 2d Lt. Homer D. McGettigan; Lt. Col. Charles R. Meyer, 2d Lt. Bill Mullen, Pfc. Norman H. Poddam, 1st Sgt. George Pravda, Pfc. Rex N. Purk, Capt. Harry L. Richardson, Jr., Capt. Julius A. Sakas, and Col. Clarence M. Tomlinson. S. Sgt. Victor L. Olson earned three Silver Stars (possibly 4 or 5) while he was assigned to the 32D Division. The Silver Star is our Nation’s third highest decoration for heroism; it ranks behind the Distinguished Service Cross and the Medal of Honor. It is fifth highest overall in the order of precedence of decorations, but the Defense Distinguished Service Medal and Distinguished Service Medal are awarded for meritorious service, while the Silver Star is awarded for gallantry or valor. Originally known as the Citation Star, it was established as a result of an Act of Congress on 9 July 1918 (amended by act of 25 July 1963). 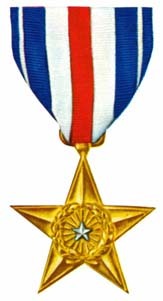 If authorized a Citation Star, a small 3/16” diameter silver star was attached to the ribbon of the service medal for the campaign for service in which the citations were given. The Citation Star was replaced with the Silver Star medal by the Secretary of War on 19 July 1932. The Silver Star is awarded to a person who, while serving in any capacity with the U.S. Army, is cited for gallantry in action against an enemy of the United States while engaged in military operations involving conflict with an opposing foreign force, or while serving with friendly foreign forces engaged in armed conflict against an opposing armed force in which the United States is not a belligerent party. The required gallantry, while of a lesser degree than that required for the Distinguished Service Cross, must nevertheless have been performed with marked distinction. This section is a long overdue addition to our website. It is going to take a considerable amount of research and transcribing in order to (hopefully someday) complete this roster of heroes. We have to start somewhere, let us start with these eight hundred and twenty brave men who earned eight hundred and forty-four Silver Stars. Additional 32D Division Silver Star recipients from WWII will be added to this roster as time permits. Much of the information on this roster was collected from the outstanding Military Times Hall of Valor website, the outstanding Home of Heroes website, as well as numerous other historic references.